Spittin Toad: For the Love of Birds ....Hummingbirds!! So many people seemed to enjoy my post about my new bird feeder...That this week I thought I'd share with you my "Hummingbird Garden". It's hard to imagine how such a little bird can give one so much pleasure...but they do!! I have learned that if I plant my pots with the right plants, my patio will be full of those happy little guys zipping through everything...Sometimes right between us while were eating dinner. Of course by now you know my favorite time to enjoy them..... is with that morning cup of "Java" when the sun has just begun to flood the patio...Ahhh Heaven!! So by now you are probably wondering what does she plant in those "Patio Pots"? 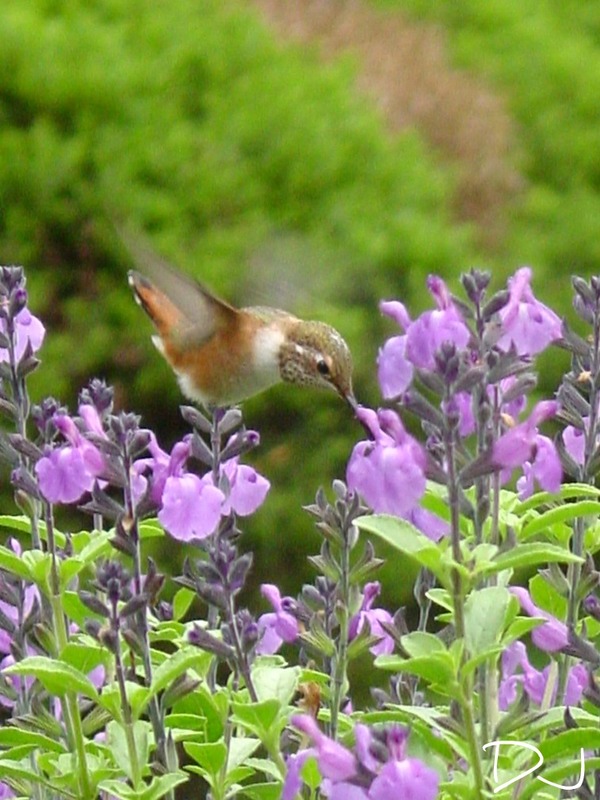 Well.....My #1 chose is any variety of Salvia this plant seems to be... by far the favorite of my "Hummers"! Salvia comes in colors from coral to pink to blue....My faves are always the blue variety's...but I do love the white and pink of "Hot Lips" and often plant that one in my garden beds too! 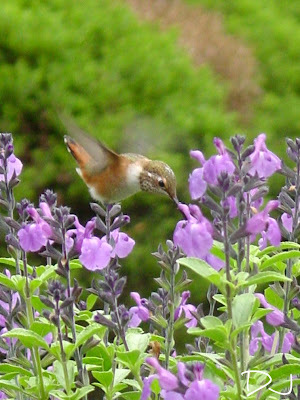 As for the Hummingbirds...They don't seem to care what color...They are always drawn to Salvia! I have planted many different vines threw the years and the "Chilean Glory Vine" is equally loved by both the hummingbirds and myself...Even the seed pods are fantastic!! Although I don't have it in pots I need to mention that Crocosmia is also a favorite...I have it planted carelessly in the garden under the fire pit, where I can see it from my kitchen window and by August it is a major attraction for the little birds! We (the Hummingbirds and I) also adore the Hardy Fuchsia...I have varieties planted throughout my garden and in my patio pots. I love the contrast of the bright orange pedals against the black centers of the Black Eyed Susan Vine...but I have yet to see a hummingbird visit it. Please check them out!! And don't forget to leave a comment and say HI! Oh wow! You got so many great shots of those little guys. I am amazed! I get a few but never seem to have my camera on me when they are around. I enjoyed the photos you took of the hummers on your flowers, it's hard to get them. They do bring a lot of pleasure to backyard bird watching. Pretty, pretty, pretty! Really, like Heaven! I love when hummingbirds come into my yard!